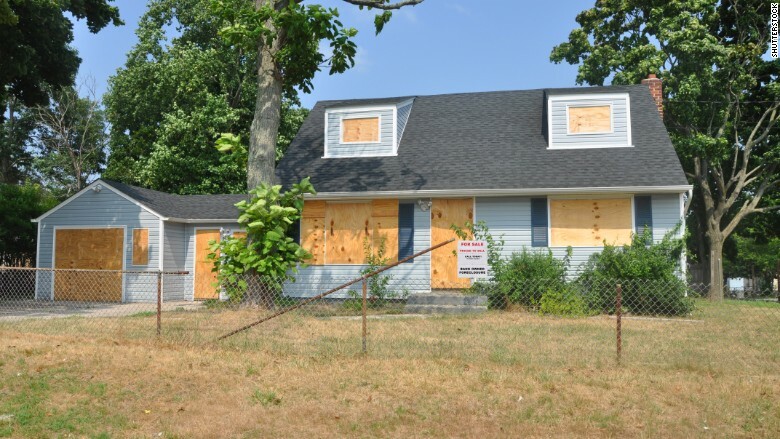 New Jersey, New York and California saw a resurgence in zombie foreclosures over the past year. Vacated by the homeowner and left unattended, zombie foreclosures are still plaguing many housing markets. Nearly one in four homes in foreclosure at the end of January were already abandoned by the owner before being repossessed, a recent RealtyTrac report found. And while the number of zombie foreclosures has fallen 6% from the year before, 19 states have seen a resurgence, including New Jersey, New York and California. The state of New Jersey, for example, saw a 109% increase in total zombie foreclosures, with surges in metro areas like Atlantic City and Trenton. Meanwhile, New York saw a 54% increase, with jumps in the Albany, Poughkeepsie and the New York City metro areas. Other states, including North Carolina, Tennessee and Virginia, have also seen significant increases in zombie foreclosures over the last year. Zombie homes often have uncut lawns, shuttered windows and other signs of neglect that can turn away buyers and drag down the value of nearby homes. "These are the sore thumbs in any neighborhood," said Daren Blomquist, vice president at RealtyTrac. "The very visible signs of distress are there with these properties." But an increase in zombie foreclosures isn't always a bad thing, said Blomquist. He said more of those abandoned homes are finally making their way through the foreclosure process, and are now closer to being resold or demolished. "Some of these have been sitting there and the bank hasn't started foreclosure for years," said Blomquist. "The fact that they're entering into the public record data that we're collecting is an indication that the banks are finally moving forward with them." The states where RealtyTrac found the most zombie foreclosures -- Florida, New Jersey and New York -- are also among the states with the most drawn-out judicial foreclosure processes, said Blomquist. According to RealtyTrac, it takes an average of 1,057 days, or nearly three years, to foreclose in New Jersey, 946 days in Florida and 934 days in New York, waits that are exceeded only by the delay in Hawaii. Also helping to move things along are rising home prices, which have been giving banks hope that they may be able to break even or come out ahead on defaulted loans, said Blomquist. Blomquist expects that many former zombies will sell quickly as they meet pent up demand in certain markets. "They will probably still sell at discounted prices compared to a non-distressed property," he said. "But there is demand and a lot of buyers are looking for this type of discounted homes."